This article provides an update to the performance results from benchmarks running on the new Android ART runtime on Android 4.4.2. This is not a review. ART is only meant for developers at this time, so don’t use it if you have critical apps on your phone. My previous article is still available: Dalvik versus ART benchmarks on a Nexus 5. If you have a smartphone running Android 4.4.2 “Kit Kat”, and you have activated the developer options in settings, you may have noticed a new option to select the runtime. In all previous versions of Android, the runtime was “Dalvik”. 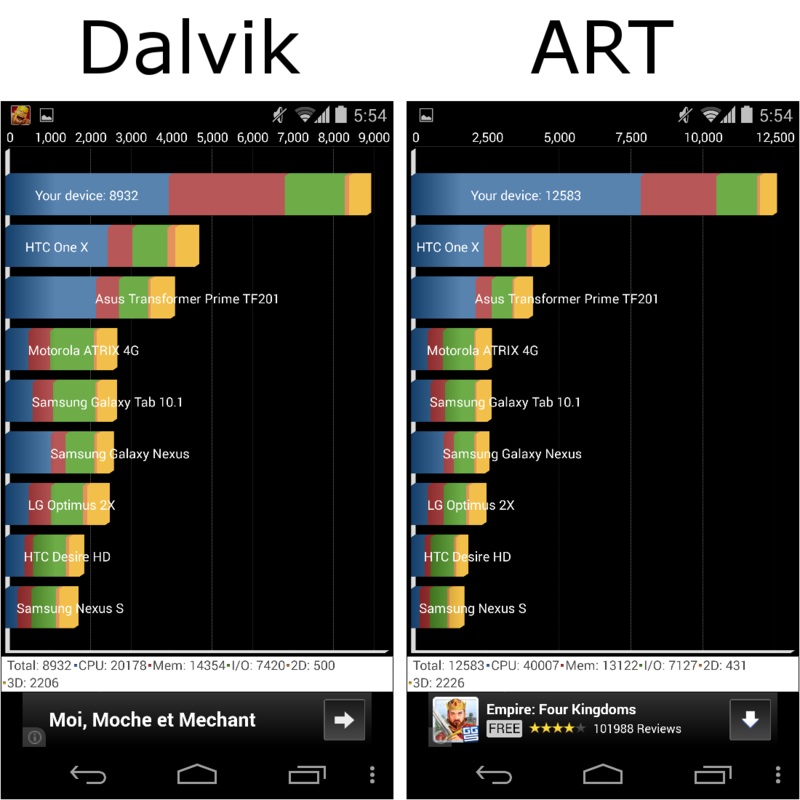 Google now offers “ART”. 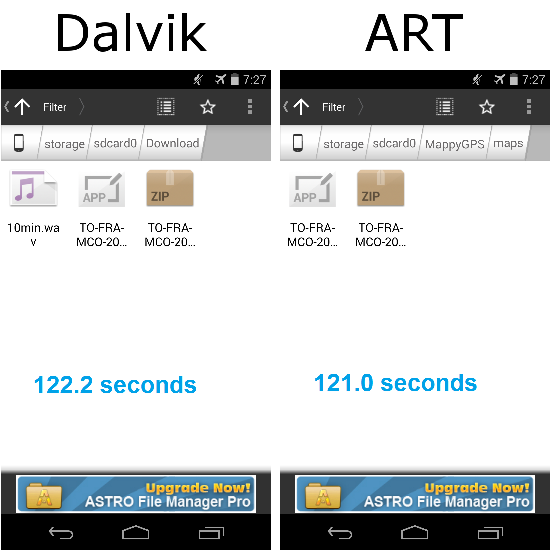 ART will one day let you run all of your apps faster and with less power by using ahead-of-time compiling. 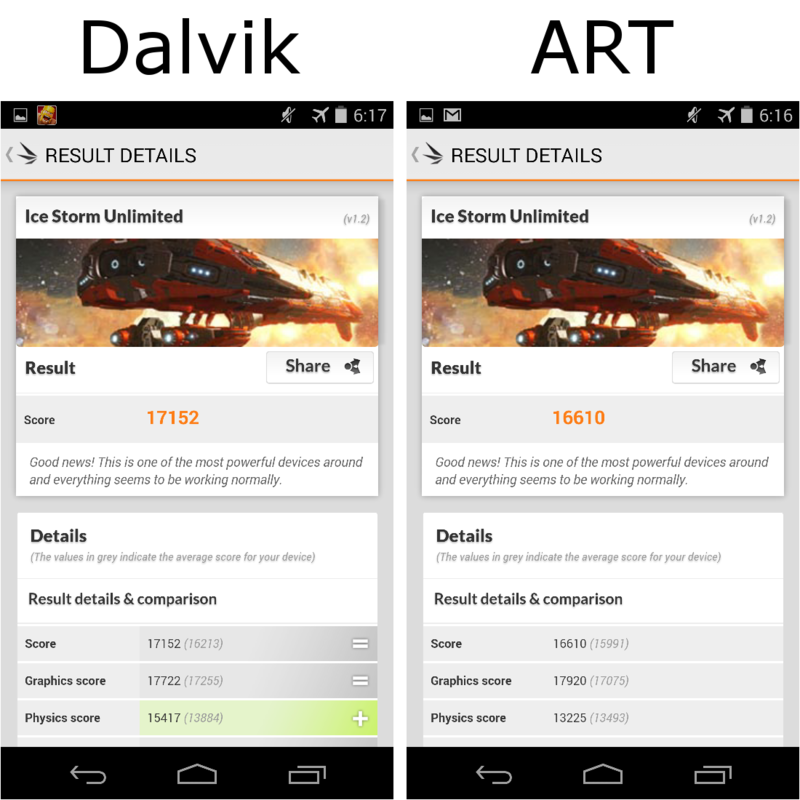 As of May 2014, ART is still not at that point, but Google wants developers to try out the new runtime and give feedback. ART is not meant for the general public yet. There are still bugs, and some apps won’t work. 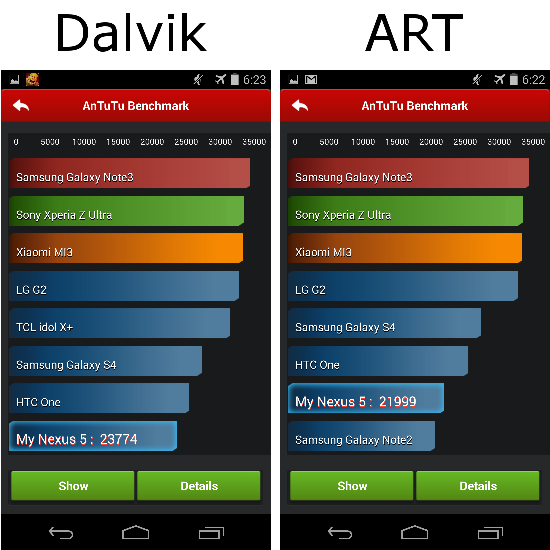 Once again, I wanted to see how ART does at running benchmarks with the updated Android 4.4.2 release. 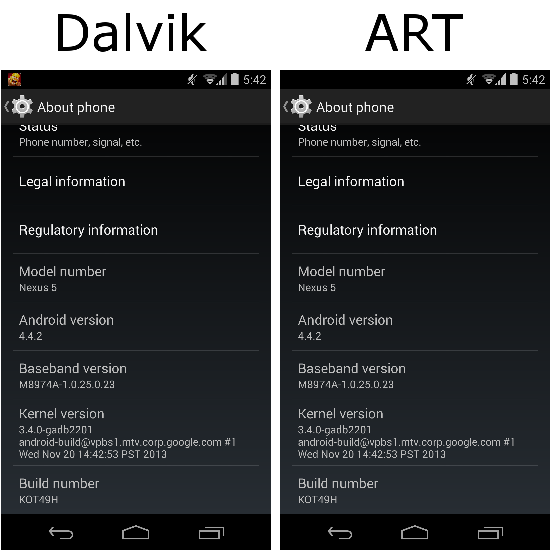 I used two Google Nexus 5 smartphones running Android 4.4.2. This time, I ran all of the tests “unplugged” (on the battery). The specific hardware and firmware is shown in the screenshot below. When the “Developer options” are activated, they show up in “Settings” just above “About phone”. 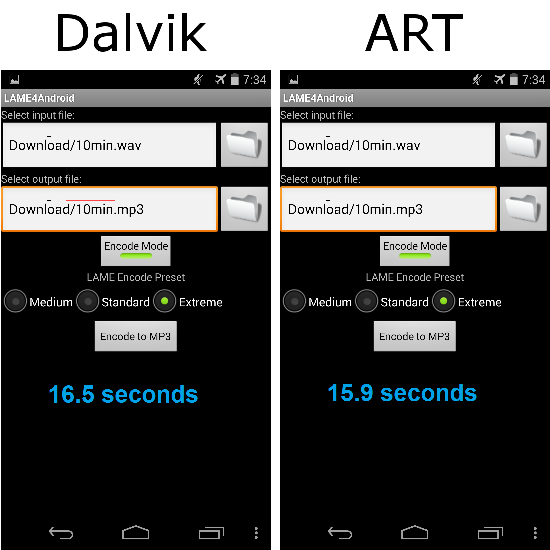 You can switch to ART under the “Select runtime” option. 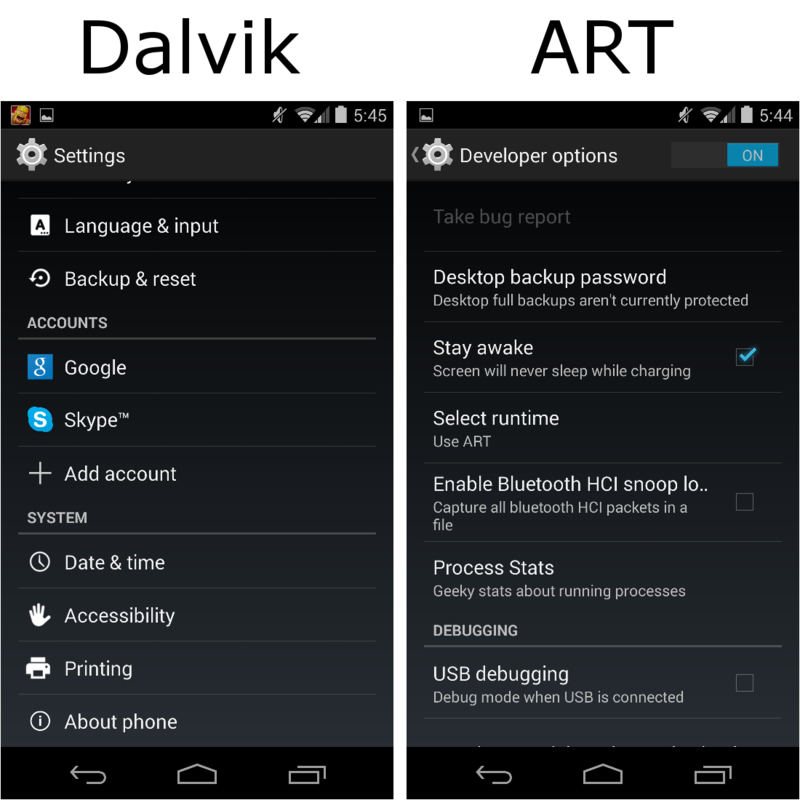 Without “Developer options”, the phone defaults to “Dalvik”. 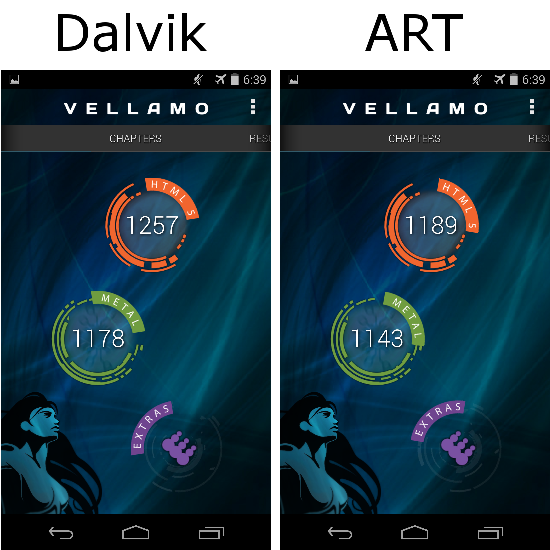 The screenshot below shows one phone running Dalvik and one running ART. All of the benchmark apps are available for free on the Play Store. 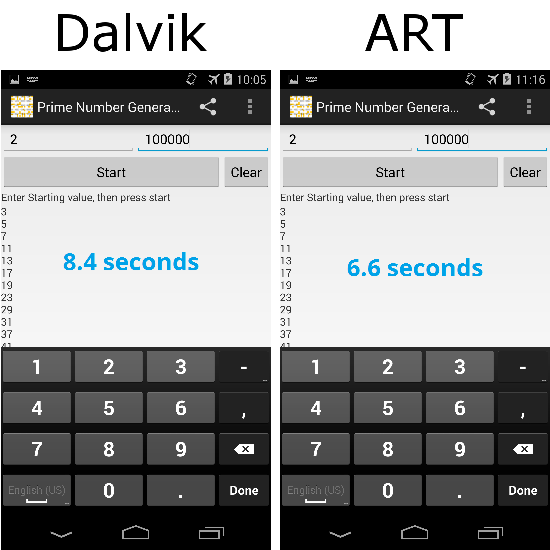 I wanted apps that people could try on their current phones for comparison. 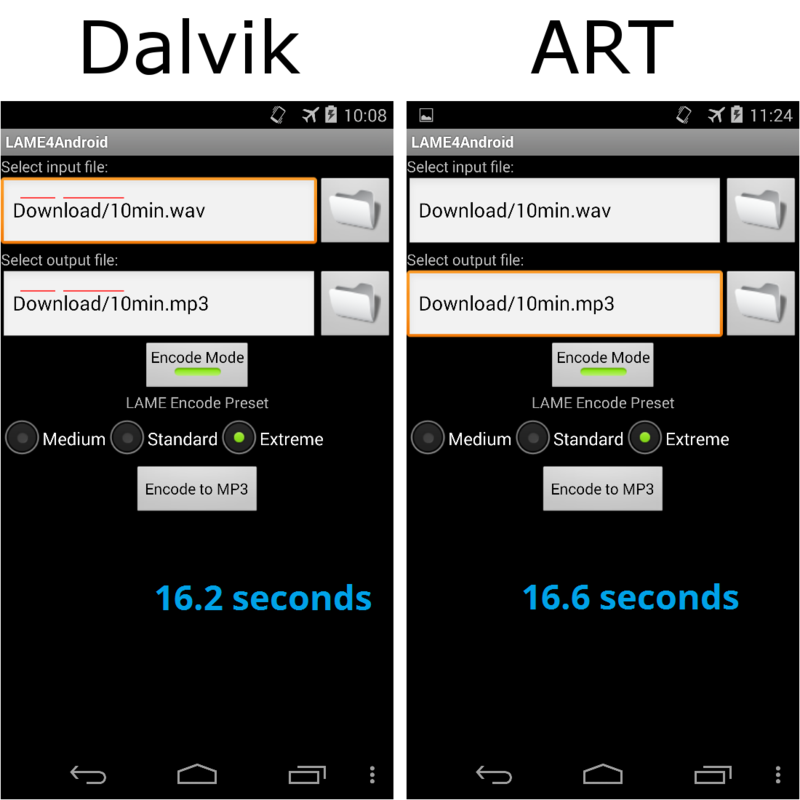 I ran all of the tests on the Dalvik and ART phones. 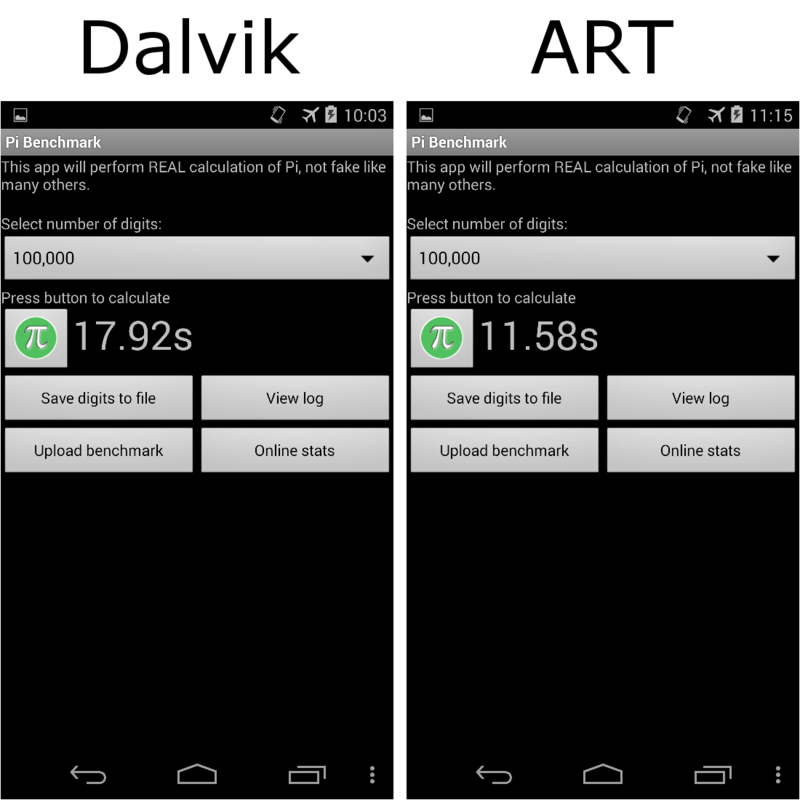 I only ran each test one time, and the phones were not reinitialized, so I may have some incorrect results. I did not use airplane mode for this benchmark, as it requires a network connection. I ran this benchmark in airplane mode. 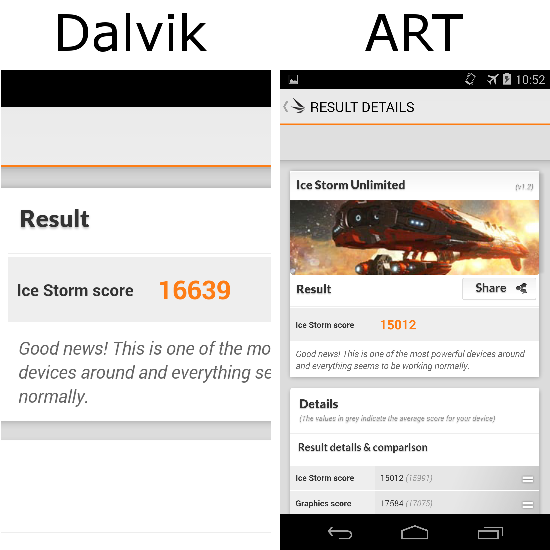 According to the developer, 3DMark is “the world’s most popular performance test”. I ran this app in airplane mode. It was not designed as a benchmark, so I counted video frames to determine the run times. (I inserted the blue text on the screenshots.) I generated prime numbers from 2 to 100 000. 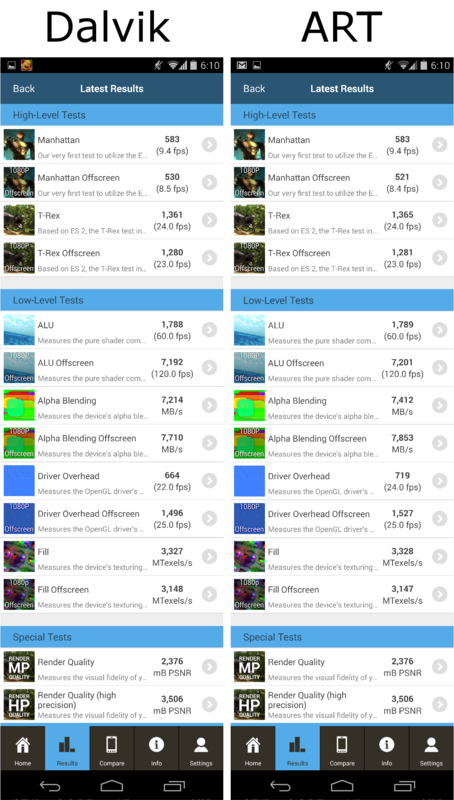 Also, you may have noticed that these are old screenshots from the earlier tests. I forgot to take new screenshots for the Prime Number Generator, but I did insert the updated times. I ran this app in airplane mode. It was not designed as a benchmark, so I counted video frames to determine the run times. (I inserted the blue text on the screenshots.) I encoded a ten minute mono 44 KHz audio file (local French news program) at the “Extreme” setting. I ran this app in airplane mode. It was not designed as a benchmark, so I counted video frames to determine the run times. (I inserted the blue text on the screenshots.) I used the built-in zip function to compress a 380 MB file. The test file was the map of France in Mappy GPS Free by Mappy S.A.
All of the apps in this study ran flawlessly on the new ART runtime. 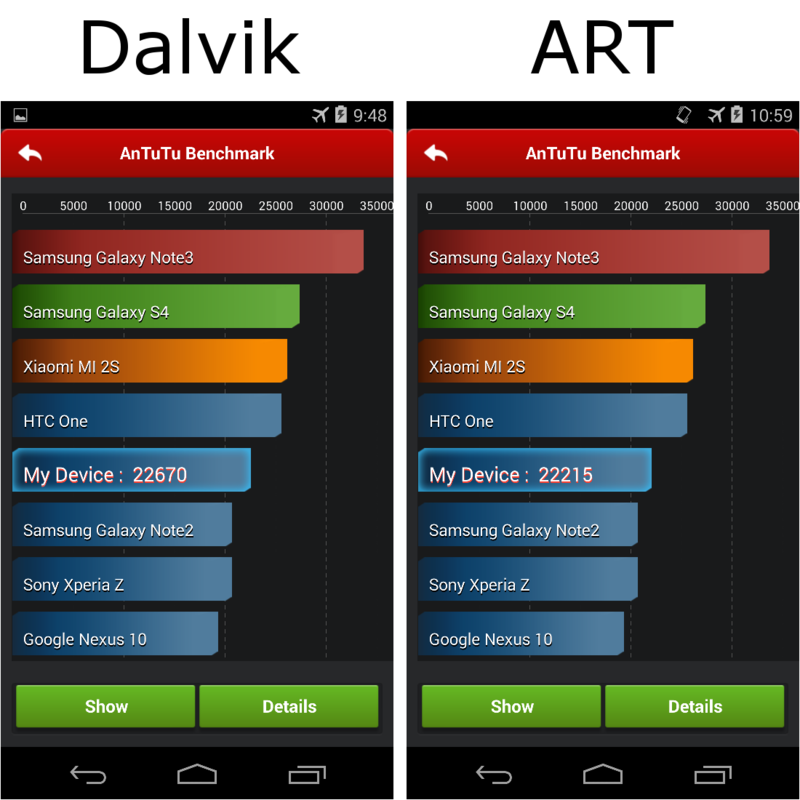 Most of the benchmarks ran at similar times, but some did show a significant difference in performance. 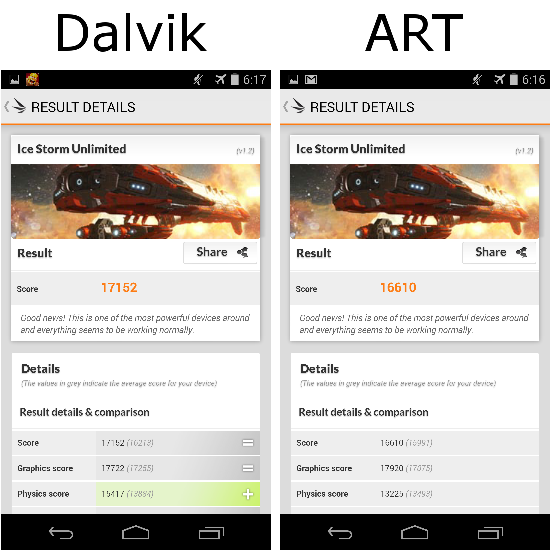 Google will certainly continue to work on improving ART before possibly making it the main runtime. Until then, it would be a good idea for developers to test their apps on ART. You can let me know what you think of the results in your comments below. 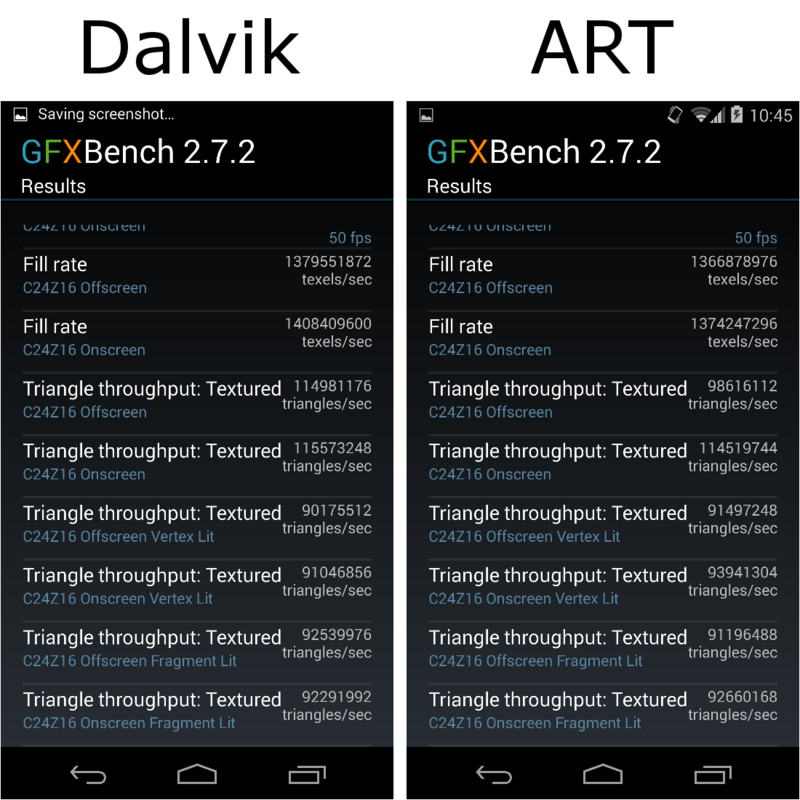 This entry was posted in Technology and tagged 3DMark, AndEBench, Android, AnTuTu, ART, Basemark, benchmarks, comparison, Dalvik, GFXBench, Google, Nexus 5, Quadrant, runtime, SlingPlayer, Vellamo, versus on 11 May 2014 by John Miller. 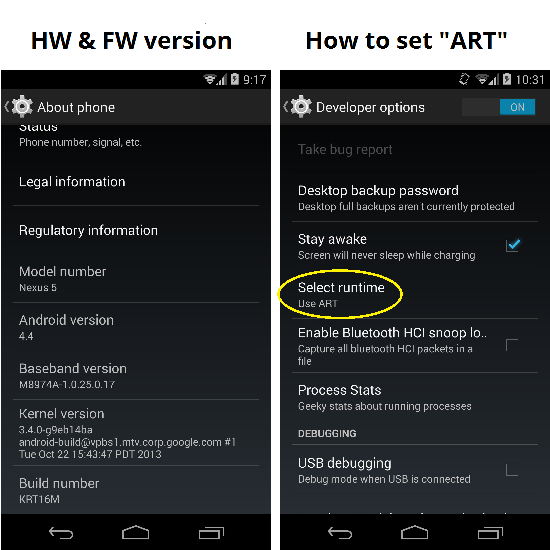 NOTE: AN UPDATE TO THIS ARTICLE IS AVAILABLE WITH ANDROID 4.4.2 RESULTS. 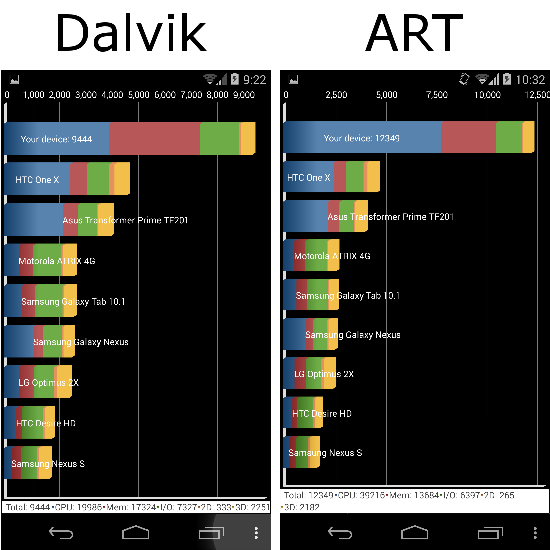 The new article provides updated results with two separate phones running Android 4.4.2 Kit Kat. Also, the updated tests are all run “unplugged” (using the battery) and use the latest versions of the benchmark apps. The new article is available here: Dalvik versus ART benchmarks on a Nexus 5 running Android 4.4.2. This article covers performance results from benchmarks running on the new Android ART runtime. This is not a review. ART is only meant for developers at this time, so don’t use it if you have critical apps on your phone. If you have a smartphone running Android 4.4 “Kit Kat”, and you have activated the developer options in settings, you may have noticed a new option to select the runtime. 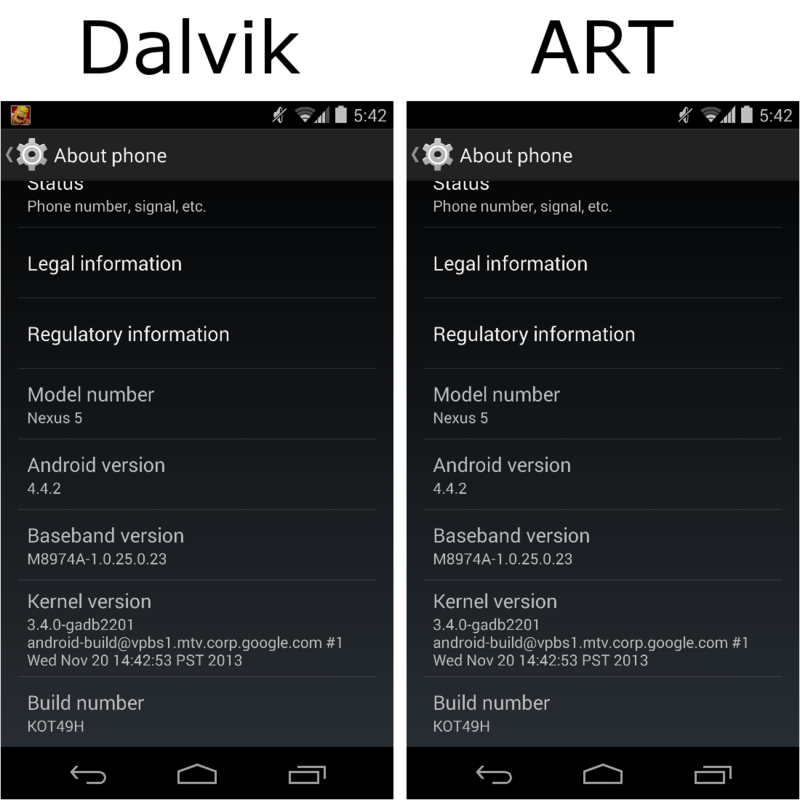 In all previous versions of Android, the runtime was “Dalvik”. Google now offers “ART”. 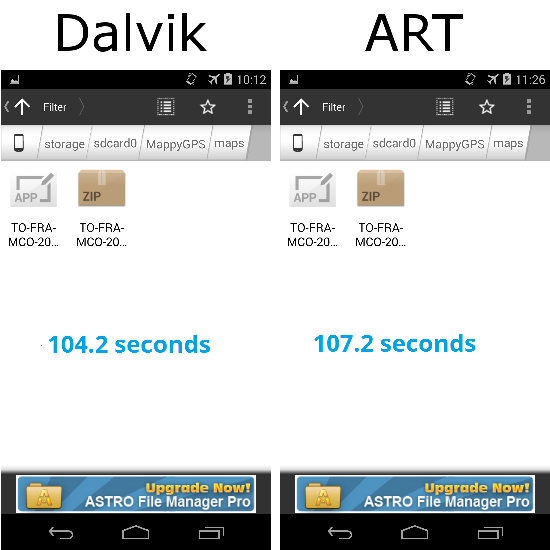 ART will one day let you run all of your apps faster and with less power by using ahead-of-time compiling. As of November 2013, ART is still not at that point, but Google wants developers to try out the new runtime and give feedback. 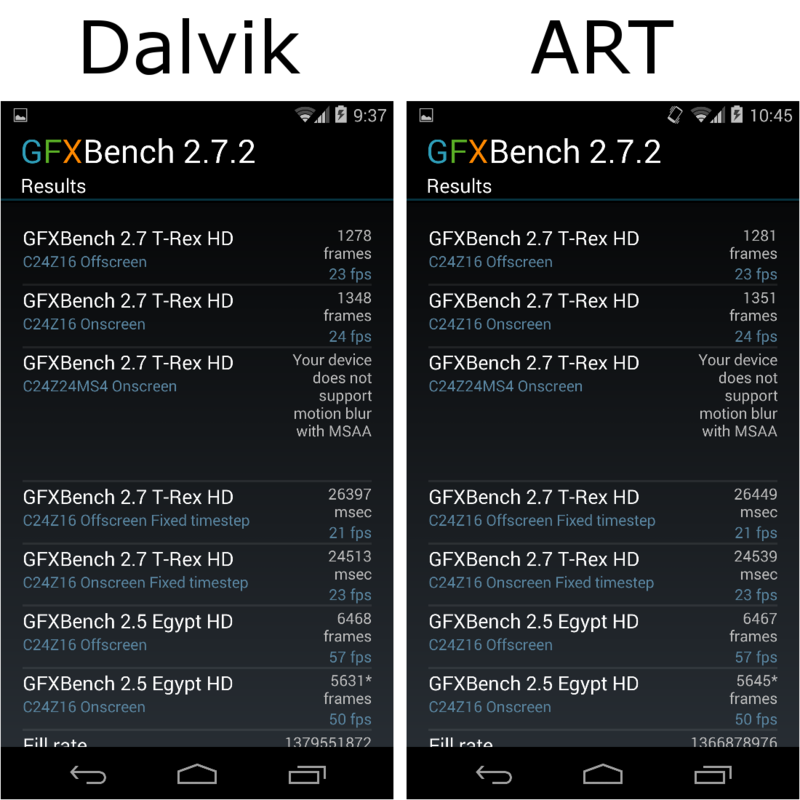 I wanted to see how ART does at running benchmarks. 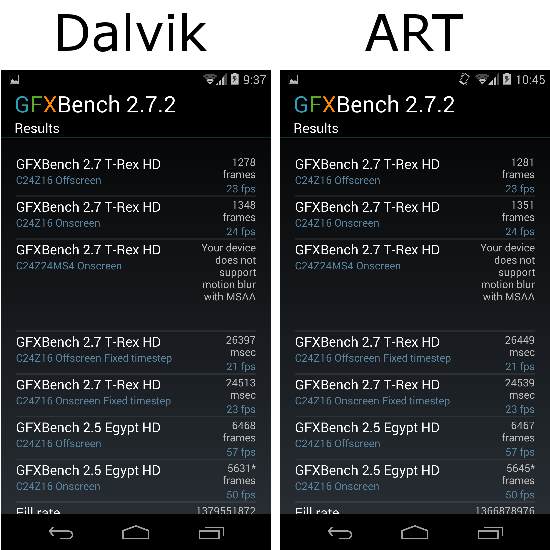 I used a Google Nexus 5 smartphone running Android 4.4. 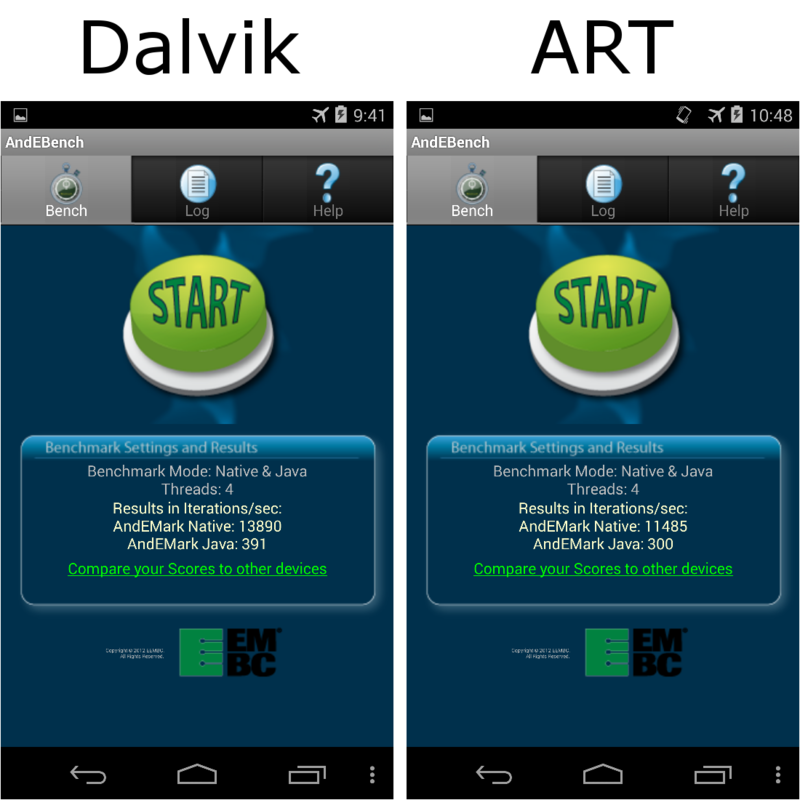 The specific hardware and firmware is shown in the screenshot below. I ran all of the tests on Dalvik. 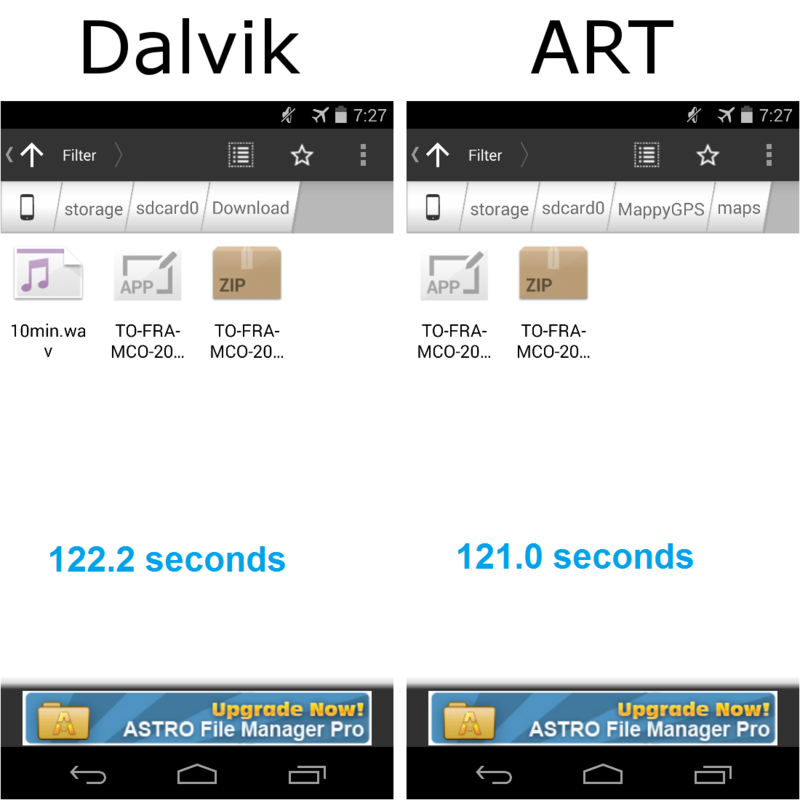 Then, I set the runtime to Art and waited about 12 minutes for my 158 apps to be prepared. Then I ran all of the same tests. I only ran each test one time, so I may have some incorrect results. I ran this app in airplane mode. It is not designed as a benchmark, so I had to count video frames to determine the run times. (I inserted the blue text on the screenshots.) 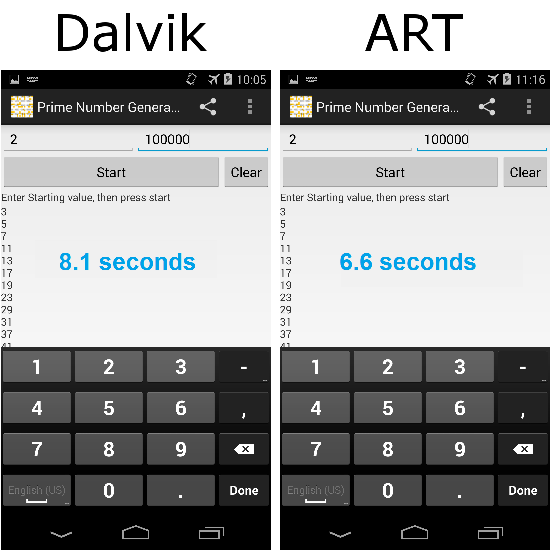 I generated prime numbers from 2 to 100 000. I ran this app in airplane mode. It is not designed as a benchmark, so I had to count video frames to determine the run times. (I inserted the blue text on the screenshots.) I encoded a ten minute mono 44 KHz audio file (local French news program) at the “Extreme” setting. I ran this app in airplane mode. It is not designed as a benchmark, so I had to count video frames to determine the run times. (I inserted the blue text on the screenshots.) I used the built-in zip function to compress a 333 MB file. The test file was the map of France in Mappy GPS Free by Mappy S.A. 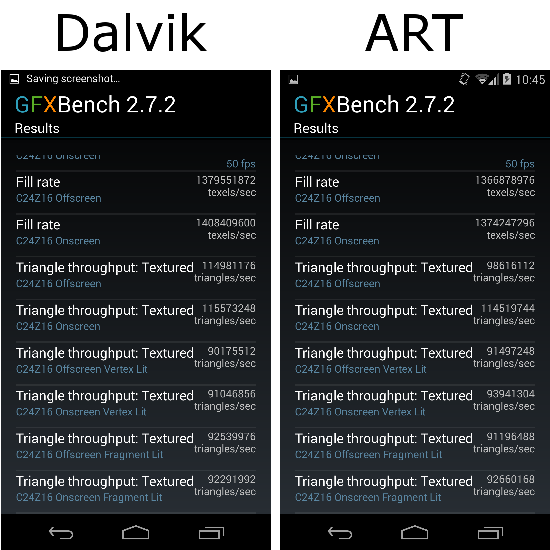 This entry was posted in Technology and tagged 3DMark, AndEBench, Android, AnTuTu, ART, Basemark, benchmarks, comparison, Dalvik, GFXBench, Google, Nexus 5, Quadrant, runtime, Vellamo, versus on 13 November 2013 by John Miller.